Newcastle’s season was a number of things, all bad none good. The club made some very interesting signings in the likes of Cabella and Riviére both of whom failed to impress. Newcastle finished in 15th disappointing for such a large club. Newcastle’s demise could be pointed out to the latter part of the season when John Carver was in charge but you can’t forget that Newcastle started the season with a run of 7 games without a win these included a humiliating 4-0 loss to Southampton where the Saints ran riot. They seemed to have a lot of luck facing the north east. This run however was followed by Pardew inspiring his side to a run of 5 wins including defeats of Liverpool and Tottenham that saw Newcastle climb and Pardew’s stock rise, this signalled that Newcastle meant business and the impressive displays from players like Jack Colback and Daryl Janmaat as well as the scoring from Perez made Newcastle a tough side to beat. 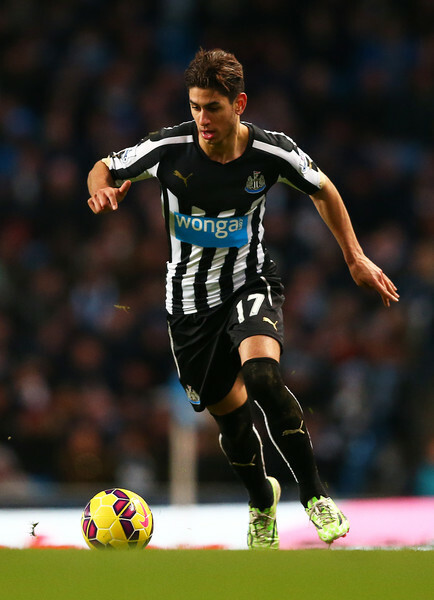 Ayoze Perez on the ball for Newcastle against Manchester City. On 6th December Newcastle became the first team to beat Chelsea that season in an emphatic 2-1 win at St James’ Park, this was a heroic display from Newcastle and showed other teams that Chelsea were not as invincible as they had seemed early in the season. This was followed though by 3 straight defeats including a loss to local rivals Sunderland and that was that as Pardew left the north east of his own accord to join up with London club, Crystal Palace. This signalled a change in Newcastle’s league standing as into the breach stepped John Carver and Steve Stone who would oversee the remainder of the season as caretaker managers and would see a horrific run of games leading to Newcastle being embroiled in a relegation battle that went down to the final game against West Ham at St James’ Park. John Carver oversaw Newcastle’s biggest defeat of the season when they faced Manchester United and crashed to a 5-0 defeat. This was followed up by a solitary win before the run of games that would see Newcastle slip from mid-table obscurity into the relegation dogfight. They suffered 10 games only picking up 1 point a 1-1 draw with West Bromwich Albion. They lost Sunderland who once again did the double over the Tyneside club and they suffered a defeat at the hands of already relegated club QPR on the penultimate weekend of the season. Their Premier League status was threatened but after Jonas Gutierrez inspired his team to 2 goals scoring 1 himself over West Ham and Newcastle could sleep easy that had retained their Premier League status, John Carver would not recover and was sacked as Mike Ashley brought in Steve McLaren. The key player undoubtedly was former Sunderland midfielder Jack Colback, Colback joined the club with high hopes of outdoing his former club and local rivals Sunderland only to find himself being 1 of only a few bright sparks donning the famous white and black shirt. The midfielder was industrious and made 35 appearances over the course of the season. He was the rock at the heart of Newcastle and his dictating of pace from the centre of the park was class. He reads the game well and has given Newcastle cause for hope as we hurtle towards next season. Newcastle fans will be hoping their local lad can give Newcastle more of what he was capable of producing last season. 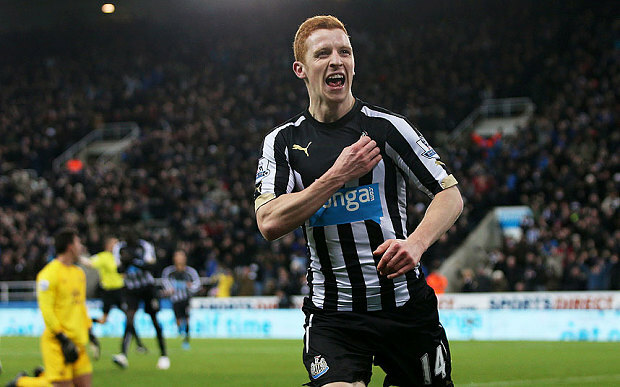 Jack Colback celebrates scoring against Everton. Newcastle have made 3 important signings as well as seeing Darlow and Lascelles come after their year long loan at Nottingham Forest. The pick of the bunch is midfielder Wijnaldum who has been nothing short of outstanding throughout the Magpies pre-season. He has scored goals and created them, he is sure to be a worthy addition at St James’ Park. Mitrovic also arrived and his scoring prowess is quite something, the forward managed 28 goals in 51 appearances for Anderlecht last season and at 20 years old is still improving as a player and is not short of confidence he and Ayoze Perez could be formidable for Newcastle for seasons to come. Chancel Mbemba has also finally arrived after questions about his age were answered and he could be a very important addition as Newcastle’s defensive woes last season were something that McLaren is keen to address. 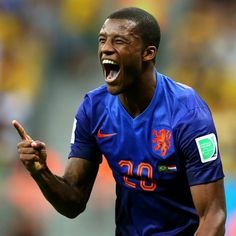 Geoginio Wijnaldum celebrates scoring a goal for Holland at the World Cup. Newcastle see a number of departures, they sickeningly got rid of Argentina international Gutierrez who’s treatment from the club has been disgusting. They also lose Ryan Taylor and their first choice left back Santon who was key to Newcastle’s defence. The core of Newcastle has been ripped out and a gaping hole will be left by the departure of long time servants Taylor and Gutierrez who were at the club during the season in the Championship and helped them regain Premiership status it is a dark time on Tyneside. Newcastle will be hoping for a better season and if they can produce some good football a top half finish. McLaren will be hoping to find a regular finisher in his side as well that have struggled for an out and out goalscorer since the departure of Demba Ba. This entry was posted in Uncategorized and tagged 11, 15th, alan pardew, argentina, battle, cabella, championship, Chelsea, cisse, colback, coloccini, core, crystal palace, darlow, defence, demba ba, football, goalscorer, gutierrez, janmaat, john carver, lascelles, liverpool, magpies, manchester united, mbemba, mclaren, mike ashley, mitorvic, newcastle, north east, perez, Premier League, relgation, riviere, ryan taylor, saints, santon, servants, southampton, st james' park, steve stone, sunderland, toon, totteham, tyneside, west brom, west ham, wijnaldum. Bookmark the permalink.